There are, of course, revelatory moments. And though they are subtle, they are brilliantly crafted. Gustavo, at one point, reflects: “Oh, how thought betrays. Next to error, betrayal is my engine. I was going to talk about two beautiful women who attracted me, as if I meant nothing by it, only to illustrate a prosaic analogy, and I’ve returned to soldiers and death. Soldiers and death.” Here, as throughout the whole of I Didn’t Talk, recollections of Gustavo’s traumas creep up from his everyday, “in line at the bank, on the bus, at the bakery counter,” and confront him with that which he has attempted to silence. The old play on words—traduttore, traditore—takes its meaning not merely from the phonetic similarity between the two words, or the deeper meaning it gives to the act of translation. The similarity is simple and it’s right there in the root of the words, both of which refer to act of passing from one side to another. We know that this going–over is never innocent and that nothing that crosses over can ever come back unharmed. 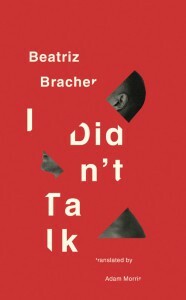 Despite Gustavo’s pessimistic conclusion, Morris’s translation of Beatriz Bracher’s I Didn’t Talk succeeds in its fidelity to the profound brazilianness of the original—its sounds, its cadences, its turns of phrase. And it raises questions as to whether a work of literature should, in this crossover, invariably be harmed. 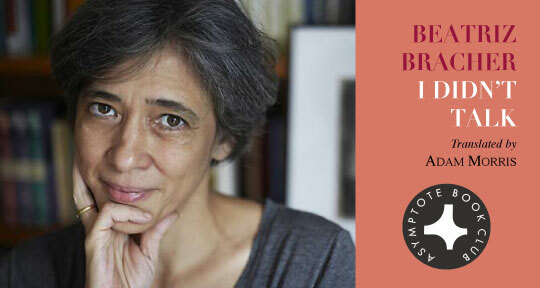 With this translation, Adam Morris introduces a singularly powerful voice of Brazilian contemporary literature to English–language readers. 1 The phrase “anos de chumbo” (in English, “years of lead”) refers to the period of heightened repression during Brazil’s military dictatorship, from 1968 to 1974. 2 In Portuguese, the word “sambista” refers to a person who composes “sambas”, a form of Brazilian music.